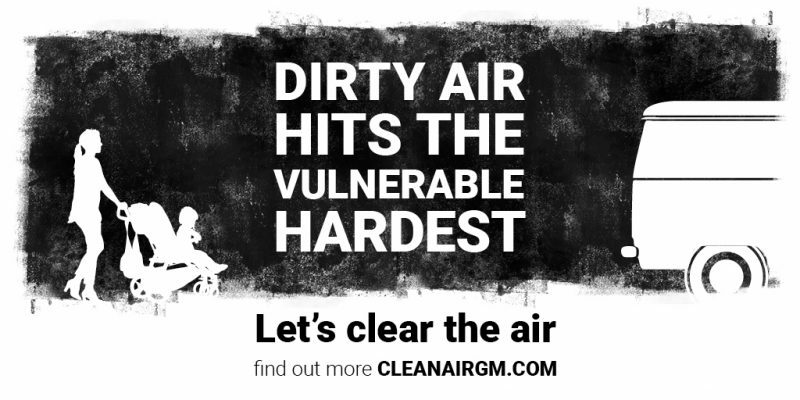 Dirty air is the biggest environmental risk to public health in the UK. In Greater Manchester alone, air pollution contributes to the equivalent of 1200 deaths a year and the greatest health threat from air pollution is posed by road transport emissions. In July 2017 the Government instructed many areas across the UK to develop measures to tackle high levels of nitrogen dioxide (NO2) on local roads. Government has identified 12 road-links in eight of the 10 Greater Manchester local authorities as likely to have levels of NO2 in breach of legal limits beyond 2020. As the main source of NO2 is road traffic, Transport for Greater Manchester (TfGM) is working with the Greater Manchester Combined Authority (GMCA) and the 10 Greater Manchester local authorities to produce a single Clean Air Plan. We’re developing the plan in collaboration with Public Health England and the Government’s Joint Air Quality Unit. The Government used a broad-brush national air pollution model which identified road-links in Greater Manchester expected to have illegally high NO2 levels beyond 2020. 152 stretches of road are likely to have levels of NO2 (more than 40 µg/m3) in breach of legal limits beyond 2020 if no action is taken. This includes busy stretches of local roads in all 10 local authority areas. It doesn’t include motorways and some major trunk roads. These are being dealt with separately by Highways England, which manages the Strategic Road Network. See map of affected roads here. To develop the Clean Air Plan, Greater Manchester is considering a wide range of measures that could help reduce roadside NO2 levels. No single measure alone will fix the problem so the final Clean Air Plan will need to include a combination of measures. No decision has been taken yet on which of these measures will be included in the final Greater Manchester Clean Air Plan. The Greater Manchester Clean Air Plan Business Case must be submitted to Government by 31 December 2018. This will include a best-performing option on how to tackle roadside NO2 in Greater Manchester in the shortest possible time, whilst complying with legal and statutory duties and in accordance with public law principles. Work will continue throughout 2019 to finalise the Clean Air Plan. This will include a public consultation, depending on the package of measures in the plan. The final package of measures in the Greater Manchester Clean Air Plan will be decided by the 10 local authorities and the GMCA. Once the final plan is agreed, a bid for money from the Government’s Clean Air Fund will introduce measures to improve air quality as quickly as possible. CityCo will be hosting a briefing for members in the new year on what this will mean for businesses, workers and customers.